Bargain BMWs available now | What Car? Now's the time to grab a nearly new BMW bargain, because we've found huge numbers of 10- and 60-plate cars sitting on forecourts. These year-old cars will have typically covered between 4000 and 12,000 miles. The 1 Series, 3 Series and 5 Series models are the most abundant. What Car? found a selection of cars at competitive prices, including an 10-plate 116d Sport 3dr with fewer than 8000 miles on the clock for 14,996 a saving of 3829 on its list price of 18,825. 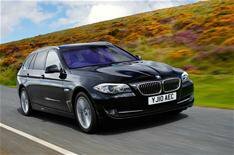 However, the best deal spotted was on a 10-plate 318d M Sport with fewer than 4000 miles. At 19,500, its 8500 less than its new list price of more than 28,000. Dont forget that these are all forecourt prices, and buyers should be able to persuade dealers to offer even bigger discounts. Some dealers are also advertising finance incentives to tempt buyers, including a 500 deposit contribution on 1 Series, 3 Series and 5 Series models.